Last summer, my husband watched a Netflix documentary about rock climbing, and that’s all it took. 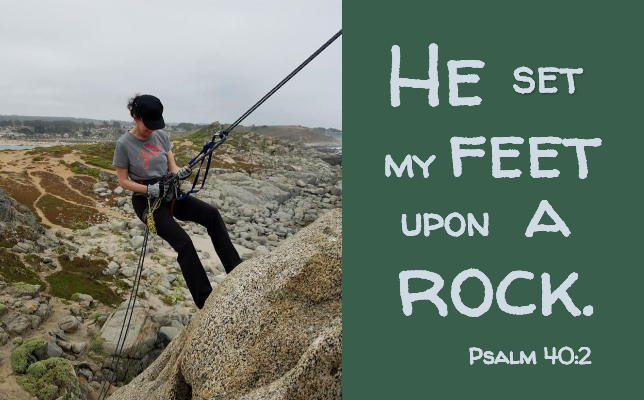 One class at the rock climbing gym, one “practice climb” in Tennessee, a hundred YouTube video tutorials, and six months later – I find myself looking for a firm place to stand on the side of a cliff overlooking the Pacific Ocean in Punta de Tralca, Chile. Maybe one day, I’ll write a post entitled, The Perks of Submitting to Your Husband’s Crazy Ideas, or, How to Get Your Parents to Pray for You More. But today, I wanted us to hang out with another “climber” who found a firm place to stand. In part two (verses 11-17), he’s stuck in yet another “pit.” Not only does part two show his trust in the Lord to lift him out again, but it is a foretelling about how Jesus allowed himself to to be “stuck” on the cross, and how God lifted him up from the grave and gave him a firm place to stand (or sit) at God’s right hand in heaven. I encourage you to read the whole psalm, but for now, I’d like to focus on the first four verses. I think we can all relate to that tendency to not wait on the Lord. We’ve probably all become impatient at one time or another, as we wait for God’s direction, answer, healing, comfort, assurance, provision, or whatever else we’re sure we need at a specific time. We kick and scream as any good control freak would, only to find ourselves even more stuck in the end. As we wait, may we learn like David did by the second part of the song, that even when troubles without number surround us (verse 12), we can still confidently say, “God, YOU are my help and deliverer” (verse 17). I love M&Ms, but not the mud and mire kind. Other versions translate it as “miry clay.” Either way, it paints a picture of a really wet, sticky, mud and clay mixture that you can’t get out of on our own. In fact, the more you try to struggle and figure it out on your own, the more stuck you’ll be. We all have our own mud and mire. We’re not sure what David was going through in part one of this psalm, but since he doesn’t mention a big war or life-threatening illness, it’s possible that the mud and mire was all internal. Maybe he was depressed. Maybe he was insecure. Maybe he was ashamed. Maybe he thought he would be “farther along” in life by that point. Our inner mud and mire can be just as sticky (and maybe even more) than even the most difficult or tragic external circumstances. Wait patiently while trusting our Loving Father to lift you out. We have no reason to not trust You, but sometimes we forget that Your ways are higher and better and wiser than our ways. You are the One who lifts us up and gives a firm place to stand. Help us to not give in to condemning comparisons. Help us to give up our hard-earned control-freak status. And help us to fix our eyes on Your Son Jesus, the author and perfecter of our faith in You. Amen.